It’s that time again! I’m back with another edition of Sweet Sightings, the post where I highlight some of my favorite things from around the world wide web. 1. One of my real-life best buds is releasing her first book, and I could not be more excited! The Bearfoot Baker’s, 100 Animal Cookies: A Super Cute Menagerie to Decorate Step-by Step, due to release on October 1st, is available for pre-order now. To get your copy, click HERE. 2. I’m so in love with That’s How I Dough’s football stadium cookie platter, that I can’t wait for my husband’s next game day get together. 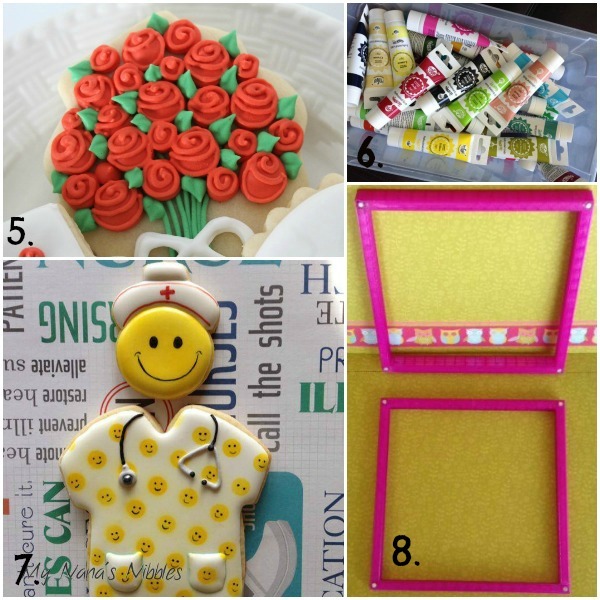 I’ve been waiting over a year to try my hand at this quick, cute cookie idea. 3. It’s time again for the third annual Go Bo! Bake Sale in honor of Bo Johnson, who was taken too soon after a battle with leukemia. Bo’s legacy is simple. Love each other, help each other, have your neighbor’s back. If you see someone in need- even a stranger- reach out and help. This world can be a better place if we care and help each other. With bakers from 42 states (and 16 countries), The Go Bo! Bake Sale is just a few bakers short of coloring the entire US orange. If you live in Alaska, Delaware, Hawaii, North Dakota, South Carolina, or South Dakota and are interested in contributing, contact jillfcsgobo@aol.com for more information. Together we CAN make a difference. 4. Wilton has released new Halloween cutters and I kind of love them all. I found several new designs at Walmart including these adorable Frankenstein cutters. If you’re not near a Walmart you can order a similar set here. 5. I love it when a little goof turns into something wonderful. 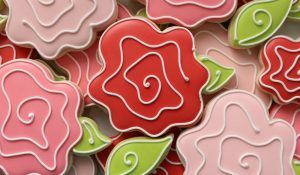 While piping simple roses Clough’D 9 Cookies made a mistake. What a glorious mistake it turned out to be! Check out her version of swirly roses here. 6. I was recently introduced to Rainbow Dust Pro Gel professional grade food coloring via Instagram. After reading several stellar reviews, I ordered the entire set. I am especially excited to try the gray and pink colors. To purchase your own, visit How Sweet is That? and take advantage of $9.95 flat rate shipping to the United States. 7. How smart is this idea? 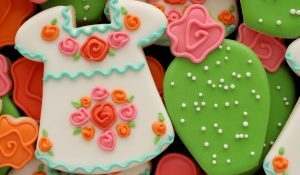 I love how My Nana’s Nibbles used a stencil to create the smiley face pattern on these adorable scrubs cookies. 8. 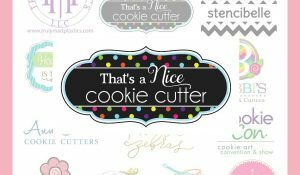 I’ve been affectionately calling Creative Cookier’s “Stencil Genie” a contraption, but that doesn’t begin to describe this amazing new tool. 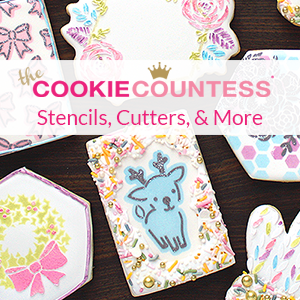 This magnetic plastic frame has revolutionized the art of stenciling on cookies. It’s now easier than ever to get consistent results every single time. To order yours, click here. You will not be disappointed. 9. I’m a sucker for cookie books, and this one is no exception. 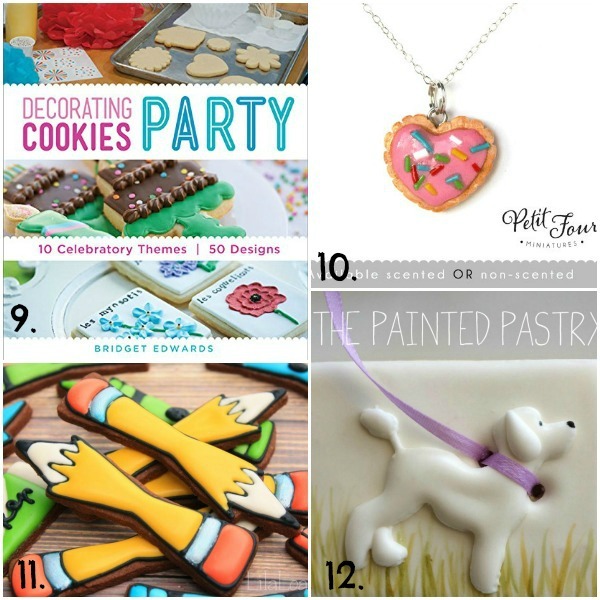 Bake at 350’s second book, Decorating Cookies: 10 Celebratory Themes, 50 Designs is available for pre-order now. 10. 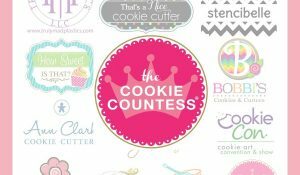 Cookie people need cookie jewelry, right? Find this necklace along with other sweet baubles at Petit Four Miniatures on Etsy. 11. Have I mentioned that I am huge Lila Loa fan? I pretty much love everything she does. I’ve been waiting all year for her pencil cookie tutorial. Check it out here. 12. And last but not least, I’ve seen ribbon on cookies, but never quite like this. I love this sweet puppy cookie, part of The Painted Pastry’s submission to a recent Practice Bakes Perfect Challenge. I just LOVE your weekly wrap up of sweet sightings! Thank you for including the 3rd Annual Go Bo! 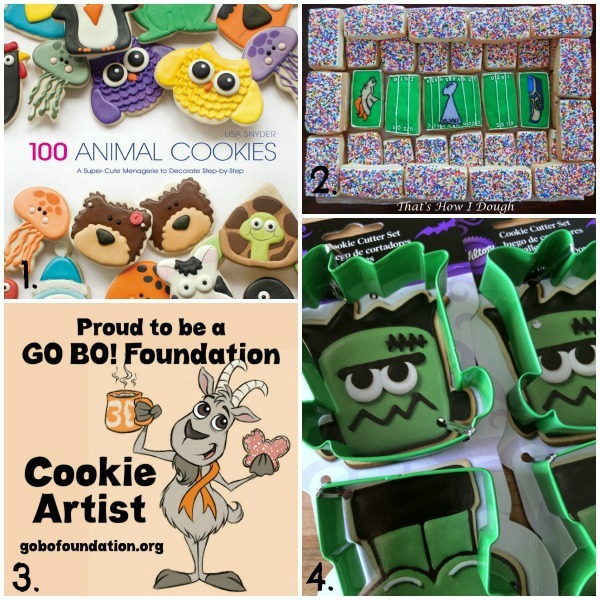 Foundation Bake Sale and helping to spread Bo’s message. ? Love all your picks! That cool frame thing I want, and I’ve only airbrushed one time!!! LOVE that Painted Pastry dog the mostest! Thanks for the shout out for my Challenge too! I like all of your posts. I access our site daily. You are so informative and seem to be a very easy going person. . Thanks for the Petit Four necklace link! I’m going to email her and see if see has done a cinnamon roll for a baker friend! The sweet sighting is wonderful for getting great post.